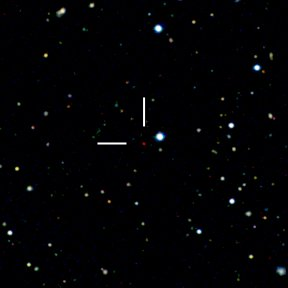 Image of the new most distant quasar ULAS J1120+0641. 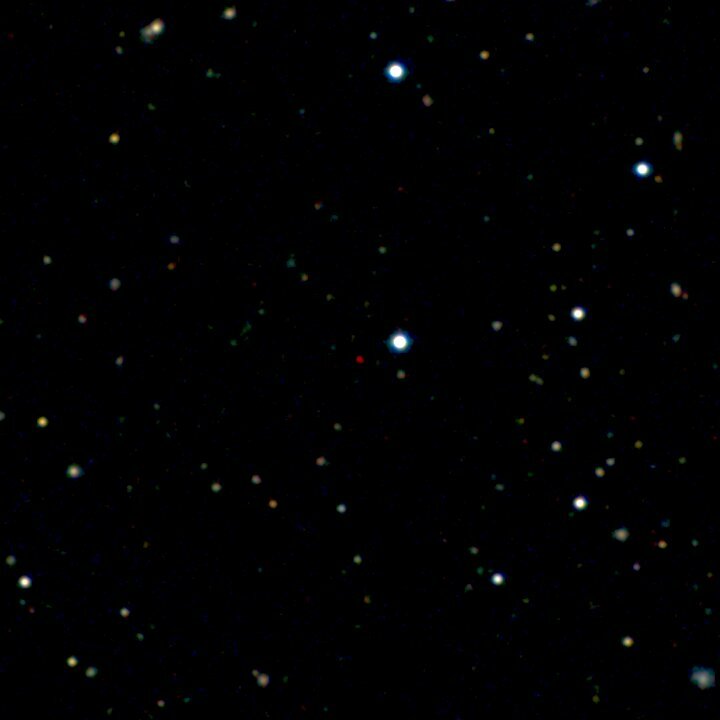 The quasar is the red dot near the centre of the image (marked with lines). The picture is a color composite made from images taken with the Liverpool Telescope and the United Kingdom Infrared Telescope. The quasar lies in the constellation Leo, a few degrees from the bright galaxy Messier 66. 29 June 2011: An international team of astronomers, including Dr Chris Simpson of Liverpool John Moores University's (LJMU) Astrophysics Research Institute (ARI), have used the Liverpool Telescope, owned and operated by the ARI, to help discover a black hole more than a billion times the mass of our Sun, seen when the Universe was only 770 million years old. Although no light is emitted by the black hole itself, its strong gravity pulls in surrounding gas that is heated up and shines as what astronomers call a quasar. The existence of such a massive black hole so soon after the Big Bang presents a challenge to theories that attempt to describe the formation of galaxies. The quasar, known as ULAS J1120+0641 based on its location in the sky, was originally identified in images of the sky taken by the United Kingdom Infrared Telescope (UKIRT) as part of the UKIRT Infrared Deep Sky Survey (UKIDSS). UKIDSS has observed approximately 5% of the sky and the team select quasar candidates based on their colours in the survey. These candidates are then followed up with the Liverpool Telescope to weed out contaminants. "Distant quasars have very distinctive colours in the UKIDSS data that allow them to be identified," says LJMU's Dr Chris Simpson, who leads this part of the project. "Unfortunately, these colours are also shared by cool stars in our own galaxy and we need additional images in visible light to tell them apart. It is the ability to schedule such observations with the Liverpool Telescope as soon as a candidate has been found in the UKIDSS data that makes it such a vital part of this process." After the Liverpool Telescope observations appeared to verify that the object was a distant quasar, further data from the 8-metre Gemini North Telescope and 8-metre Very Large Telescope, operated by the European Southern Observatory, confirmed its distance. "This is an exciting result as this quasar provides a unique luminous beacon in the early universe," says Dr Daniel Mortlock of Imperial College, London, lead author of the study. "It is much brighter than anything else at this distance and we can use it to study what conditions were like in the early universe." The results are presented in the June 30, 2011 issue of the journal Nature.